Tampa, FL - Hitting the ground running with an aggressive store opening schedule, ACME Sports and Entertainment announced the official launch of Casa Havana Coffee Bars & Cigars. The innovative concept merges the success of coffee giant, Starbucks Coffee, with a smoker-friendly atmosphere for cigar smokers, the company explained in an announcement. Casa Havana is opening three locations in the Tampa Bay area in February 2008 and projects an additional 11 locations by year-end 2008. ACME Sports, which owns and operates Tabacaleras Cubanas USA of Ybor City, Florida, will sell their own cigars at the Casa Havana locations. Ybor City is the home of Florida�s oldest cigar factories offering authentic Cuban-style hand-rolled cigars. Casa Havana will begin opening locations during February and average one new store per month thereafter. Locations for New York, Chicago, Atlanta, Miami, and Orlando have already been identified. Casa Havana plans to become a �significant niche player in the $9 billion-per-year coffee sector by catering to the 21 percent of customers who are smokers,� according to a statement. 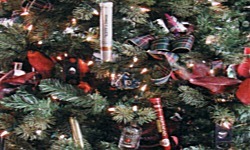 The Cigar Tree was the winner of the People�s Choice award in the 2007 Ellensburg Downtown Association�s Festival of Trees, a holiday event in Ellensburg, Wa. A cigar smoker�s delight, the tree contained 57 premium cigars courtesy of The Lil� Brown Smoke Shack; 28 lighters and 10 stainless steel cigar cutters from Csonka Worldwide; and thirty 50 ml bottles of Pendleton oak barrel-aged whisky from Hood River Distillers. Marty�s Cigar and Divan in Glendora, Calif., hosted the West Coast premiere for La Perla Habana�s newest release, the Cameroon-wrapped Black Pearl Morado, on Nov. 4th, where La Perla Habana owner Doug Wood joined door prize winners. 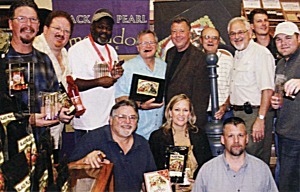 Right: Wood (center) with Robert Scipioni (left) and Americo Scipioni (right) of Atlantic Cigar Co. at their new Stroudsburg, Pa. retail store, warehouse, and shipping center, which hosted the east coast premier party for Black Pearl Morado on Nov. 17 and also featured Black Pearl wines and coffees. Among the new luxury shops scheduled to open at the new $700 million MGM Grand at Foxwood Resort Casino in Mashantucket, Conn. in May is a Dunhill boutique shop. The British purveyor of luxury goods for men will carry a full assortment of lighters, writing instruments, jewelry, novelties, ready-to-wear collections, and finely crafted leather goods.�Unlike some Dunhill retail locations, they won�t carry any other tobacco related merchandise. The new luxury Palazzo Resort Hotel Casino in Las Vegas features several cigar destinations: a Davidoff of Geneva kisok, a first-ever S.T. Dupont retail showroom, and a cigar lounge located within a sports bar created by rap star Jay-Z. The resort celebrated its official grand opening on February 10 following several weeks of unofficial operation. J. Shepherd, a new 1,200-square-foot retailer of cigars, humidors, specialty imports, and gentlemen�s accessories, in Highland, Ky., held its grand opening in December. The store is equipped with a walk-in humidor with a capacity of over 3,000 cigars, and stocks a range of accessories including lighters, cutters, vintage ashtrays, flasks, tie pins, cuff links, and more. An art gallery will feature rotating artwork by local artists. The Reserve Cigar and Wine Bar opened in south Fort Meyers, Fla. in October. Husband-and-wife owners Patrick and Laura Leslie created the cigar bar to fill a local void for an upscale venue for the after-dinner crowd. The 6,000-sq.-ft. space houses a cigar shop and the area�s largest walk-in humidor, according to the owners, while the bar is decorated with fine art and lush leather couches and bar stools. A membership package includes access to a quieter, private area with private cigar lockers, a private bar, flat screen TVs, and couches, idea for socializing or conducting business. The bar�s liquor store has its own private entrance. Maine State Fire Marshal John Dean is calling for a ban on novelty cigarette lighters that look like toys. During a news conference in January at the State House, Dean displayed more than a dozen lighters, some of which looked like a toy camera, baseball bat, tractor and motorcycle purchased over the past year in Maine. Wegmans supermarket chain announced effective Feb. 10 that it would stop selling cigarettes for the first time since its inception in 1916. The chain operates 71 stores in New York, New Jersey, Pennsylvania, Maryland, and Virginia. Aram Patel, owner of Magnum�s Cigar, Wine & Liquor Emporium, Phoenix, Ariz., is suing the Arizona Department of Health Services over its attempt to reverse the exemption of retail tobacco shops from Arizona�s state�wide smoking ban if they also have a liquor license. �We are not a bar that sells cigarettes, we are quite the opposite,� says Patel. �We are a cigar store that happens to have a bar in it.� According to Magnum�s attorneys, the Arizona Department of Health Services is now changing that guideline by arguing that if a cigar shop also has a liquor license, as Magnum�s does, that it is not technically just a �retail� store and therefore not exempt.